External auditors are accountants who work independently of a particular company. 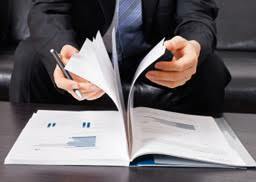 In order to ensure that the company’s financial statements are accurate, the auditors will examine the company’s records and operations. It is critical that any company is in compliance with all relevant legislation and therefore the external auditors are important to establishing a company’s credibility. The external auditors can identify small problems before they become serious and can get your business back on track. Because the external auditors are independent and don’t work directly for the company, they will be less biased and can redirect a company’s behaviour without fear of repercussion. Financial administration (specifically related to statutory responsibilities). Internal auditors or internal accounting staff can’t effectively critique the company’s internal processes because they are part of the company. External auditors, however, can observe operations from the outside and determine where the company is wasting time or money. External auditors often critique accounting practices and general operations. They can make recommendations to the company that can result in a reduction of waste or promote greater efficiency in general as well as tighten accounting practices. To learn more about external auditors, please contact us on +27 (0) 21 424 2460 or +27 (0) 11 234 4275.